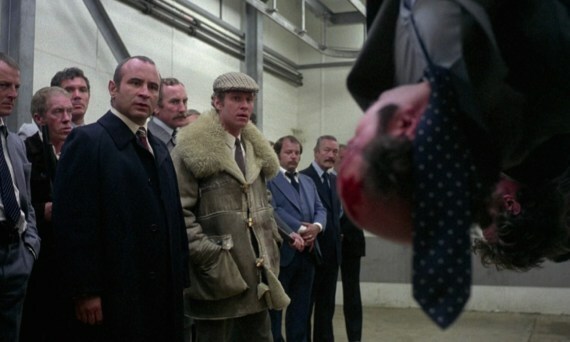 Flares, Jags, jugs (Google it), geezers, guns, boozers; The Long Good Friday is all a bit 70s Sweeney at the same time moving into the Thatcher years of the 80s with Concord, yachts and money men. The story follows Harold Shand (Bob Hoskins), London gangster overlord, as he moves to take advantage of Margaret Thatcher’s new entrepreneurial spirit and take over a large swathe of Docklands in order to go legit and make a mint (I’m coming over all Lahndahn, this is inevitable in the immediate aftermath of watching this film). Set over the course of the Easter weekend Harold soon discovers that someone is out to sabotage his plans; using deadly force. This was Bob Hoskins’ first leading film role and he brings it in every scene; his diminutive stature taking nothing away from his physical presence and simmering menace. His wife Victoria, played by Helen Mirren, is his partner in every sense; keeping her head when the bombs start going off and keeping Harold cool as best she can when he threatens to lose it completely. The film has a naturalistic style of shooting and acting which adds to the immediacy and tension of the increasingly violent events. Not afraid to get his hands dirty Harold is a forerunner of Tony Soprano with his loyal team round him. When Shand finally sees the truth of his nearest and dearest his inherent rage gets the better of him and Hoskins is truly frightening; one of our great screen actors the BAFTA snub in this year’s remembrance section still stings. I think that Cliff Martinez owes a debt to Francis Monkman whose amazing synth soundtrack on Long Good Fridaymust surely have been an inspiration behind the music for Drive. It helps accelerate the relentless action especially in the beginning 10 minutes of the film when there is little dialogue. The supporting characters give solid good turns; a disturbingly young Pierce Brosnan says nothing but looks good in Speedos, Derek Thompson is perfect as Harold’s second in command Jeff (and once you’ve heard him say ‘I wanna lick every inch of you’ to Helen Mirren you’ll never look at Charlie on Casualty the same way again). There are a lot of themes explored in what at first glance is just a gangster film; terrorism, politics, race, regeneration, new money etc. It is ultimately Harold Shand’s inability to understand that his graft and his power count for nothing if you can’t negotiate with the adversary; faced with a new enemy that can’t be bought, his downfall is inevitable. The final scene is one of the most mesmerising in British cinema, showcasing Hoskins’ immense talent. This classic London crime thriller has been beautifully restored and if you get a chance to watch it whether for the first time or as a revisit you should.